Ever find a Chinook surprise? …Skookum Limechen Chuck (‘Powerful Medicine Water’), or Skookum Chuck (‘Powerful Water’). The earliest mention of this name that I’ve found yet is from 1886. In the “Medical and Surgical Directory of the United States” [click for awesome ad image], the water of this lake is advertised as “Skookum Chuck Pe Sauklee Tyee Illlihee, or Strong Water from Sacred Ground’. Huh. I wish I lived in Eugene instead! As is customary, I’m willing to act in my official capacity as Chinook Jargon blogger expert, and taste-test this lovely item. Postal address available on request, Skookumchuckers. 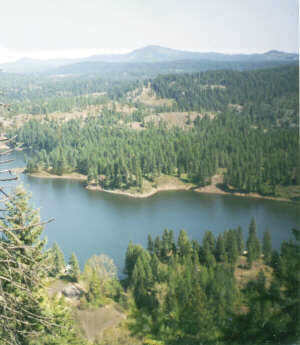 PS (June 25, 2012): In the new book “New Land, North of the Columbia”, I find a photo of Medical Lake bottled water. Too bad it’s not a label with Chinook Jargon in it!–Dave R.